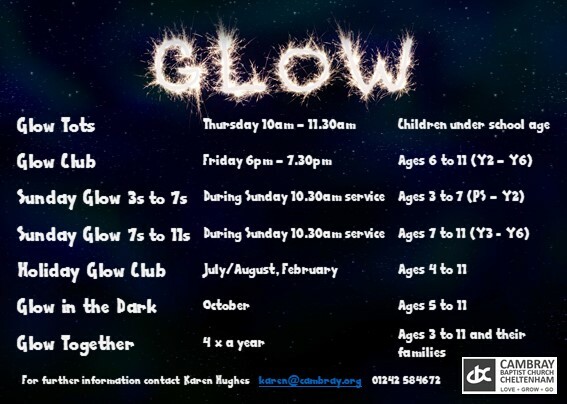 Sunday Glow 7-11s is a thriving area of Cambray life, providing those aged 7 to 11 with a Bible-centred, child-targeted, fun, safe, life-relevant and age-appropriate group to grow in their walk with God. Our aim is to provide the best hour of every child’s week – we pray that the impact of the ministry will last the other 167 hours! All our volunteers are DBS-checked and committed to partnering with parents in communicating the greatness of God, the glory of Christ and the power of the Gospel, helping children to understand that He made them and loves them. This is done in a variety of creative ways including games, craft, dramas, prayer times and Bible stories. Typically, children join the first 20 minutes of our main Sunday services and then have the option to join their Sunday Glow group. Email Sunday Glow co-ordinator Karen Hughes for more details.